Veteran Melanie Campbell ’06 at President Woo’s inauguration. 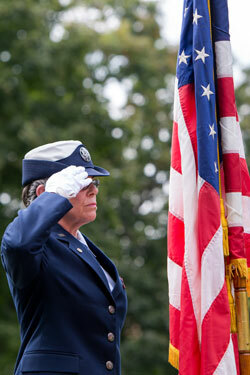 Sweet Briar College welcomes veterans to campus and we’re proud to support students who are receiving Veteran Affairs benefits. If you’re a veteran and a new student, please email a copy of your certificate of eligibility to the registrar’s office. If you’re a veteran and currently enrolled at Sweet Briar, please notify the registrar’s office if there is a change in your benefits.